Your story is unfolding today. For many it will be written by a ghost-author, to include all the text; how it begins – and how it ends. Each chapter can be titled My Job. You’ll be paid for your inputs of course. They call that a paycheck. A transactional arrangement that’s good for everybody – except it’s not. Every job you ever work will be measured the same way – in dollars and cents – and how you SPENT them. 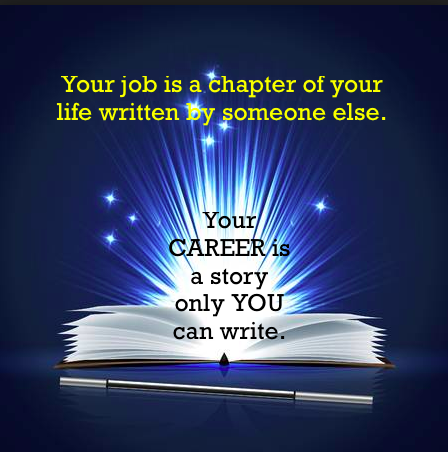 A career on the other hand, are life stories only YOU can build – the preamble, its opening chapters, the riveting adventures that unfold, and the ending – all up to you …. not your boss, not your company, and not your industry. Careers are not transactional (quid pro quo); they are transformative. They are not measured in dollars and cents but in the impact you had on others. The payoff on a job is what you bought – and its foundation is the sweat equity you invested. The payoff on a career is what you built – and its foundation is the mix of passion and commitment you invested. That job you go to work to – the one that so many only endure. It could end tomorrow. Not so for a career. Oh, it may shift and it may wind but careers go on. It’s your choices that will dictate whether you build a career – or only work a series of jobs until you retire.